Strict policies introduced by the government to cool the rocketing real estate market in the capital have led many of the city's richest residents to look overseas for their real estate investments. At the three-day 2010 Beijing Luxury Properties Showcase that ended Sunday at the Ritz-Carlton Hotel, more than 4,000 wealthy people attended who were capable of each investing at least 10 million yuan on foreign assets, according to the organizer. Ashley Woo, the sales and marketing manager of the showcase, said the exhibition organizers invited 51 domestic and international real estate agencies that had businesses in more than 30 countries. Projects being promoted during the event included ancient castles, modern apartments and ecologically important land in Canada as well as luxury villas in Thailand and real estate in large cities in the US and Japan. Woo said the average visitor to the show was a 50-something who wanted to diversify their economic strength from domestic to overseas markets. Some wanted to purchase homes for their children studying abroad. 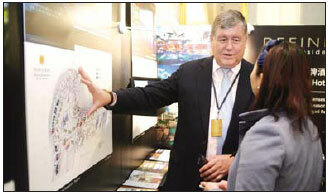 Joan Brothers, president and co-partner of Manhattan Global Properties, which was promoting four high-end apartment projects, said the Beijing market is very "exciting". She said two clients she met at the exhibition plan to fly with her to the US to see the properties. A majority of visitors have shown strong interest and one of the most frequently-asked questions is: "If I purchase an apartment, can I live as long as I want in the US?" Ally Luo, the China liaison with Brothers, said an investment in property may be beneficial in the visa application process but buyers should definitely not be under any delusion that buying a home will be a ticket to live overseas. Compared with the high-profile property agencies that responded to every question from media representatives, local buyers were keeping a low profile. Only one of the 10 people approached by METRO was prepared to speak, and then only under the relative anonymity of her English name. Jane Zhou, a 42-year-old Beijing resident who invests in jewelry and real estate, said she was very interested in buying a home overseas and added that most of her friends "have entered into the industry". She said the policy in the capital that limits families to buying only one more home has shrunk the investment options in the city and pushed people with spare money to invest overseas. "Some high-end apartments in Beijing have reached nearly 100,000 yuan per square meter, so their counterparts in large cities such as New York and Tokyo don't seem to be so expensive and hard to afford to domestic investors as they once did," she said.